Always the Bridal Florist and Never the Bride . 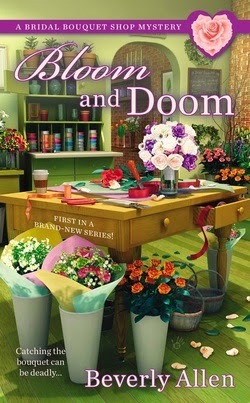 . .
Bloom and Doom is the first in Beverly Allen's new series of Bridal Bouquet Shop Mysteries. Audrey Bloom specializes in designing bouquets for Ramble, Virginia's weddings, and she has a perfect record so far: 156 brides have carried her flowers down the aisle and all of them are still married. But it seems this guarantee does not apply to couples who don't quite make it to the altar. Jenny Whitney, until recently a friend of Audrey's, is engaged to Ramble's most eligible bachelor, wealthy Derek Rawling, but now she is having second thoughts. Her alcoholic mother insists that she go through with the wedding despite rumors that Derek is seeing someone else. But when Jenny comes to consult Audrey about the flower arrangements, Audrey can tell how unhappy she is and urges her to think about what she's doing before it's too late. The next thing Audrey knows, Derek is dead and Jenny has been arrested for his murder. Of course, Audrey can't abandon her friend, even if her friend once abandoned her, and tries to find the real killer. I really enjoyed this contemporary cozy. Audrey Bloom is a fun character, and I loved her interior monologue, mostly about her grandmother's rules on being a proper Southern lady. She also knows a lot about the meanings Victorians gave particular flowers . . . anything from passionate love to approaching danger. Perfect for a mystery! And Audrey is surrounded by some great continuing characters, notably her cousin and business partner, Liv. And, needless to say, our small Southern town of Ramble is full of memorable folks, including the undertaker who has at least a bit of a crush on Audrey. But Audrey, recovering from her disastrous relationship with "Brad the Cad," isn't interested in him. Only Nick Maxwell, the delectable owner of the bakery across the street, Stud Muffin's, er um, I mean Baby Cakes Bakery, makes her consider she might be ready to risk her heart again. Throughout the not-at-all-formulaic story, Allen mixes in some laugh-out-loud moments and some genuinely creepy scenes and lots of red herrings that will keep you guessing until the end. All in all, it's a great start to what I hope will be a long series. I hope, too, that Audrey will eventually be more appreciative of her longsuffering cat, Chester. He wouldn't act up if she gave him some attention, too! You sold me! of course, I've already read it and loved it and had a read through of book two. yes, I'm bragging. I'm not sure Barb will catch her breath for a week or two. She's been busy on blog tours and real-life book signings! Great review DeAnna!!! I'm here!. I'm awake! Sort of. Thanks so much, DeAnna, for the lovely review! This looks like a promising read. Thanks, Gay. I hope it lives up to its promise! Terrific review, DeAnna! Made me want to read it all over again! What a great review, DeAnna. And I can say that I thought it was a great entry into the cozy mystery genre. Barb's handling of the story is deft and surefooted. I'm positive there will be many more to come. love this review. i need to get this book on my wish list because it sounds AWESOME. i forgot about this week's celebrations *bummer* i always enjoy book celebrations at the inkwell. now i've got to go catch up.